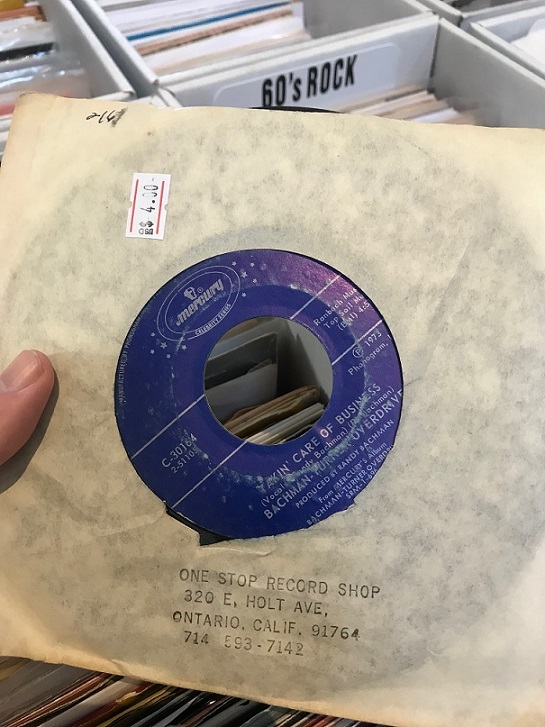 Flipping through vintage 45s Sunday at the KSPC Record and CD Swap in Claremont, I noticed a store stamp on a sleeve for One Stop Record Shop, 320 E. Holt Ave., Ontario, with the old 714 area code. This address would have been around Holt and Plum Avenue, north side of the street. 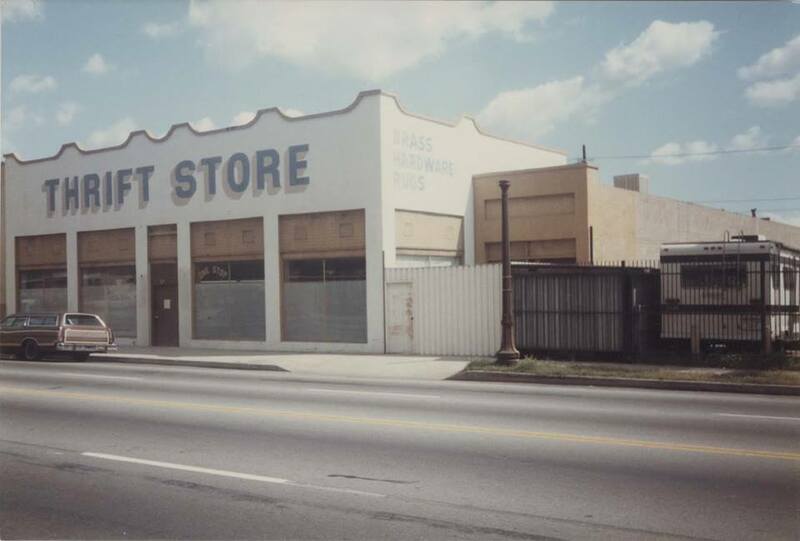 As apartments went up along that stretch a decade ago, the storefront is long gone. Anyone recall One Stop Record Shop? The record, by the way, is Bachman Turner Overdrive’s “Takin’ Care of Business,” from 1973. The sleeve may or may not be original to the record. Either way, I didn’t buy it. UPDATE: This photo from the Model Colony History Room shows the building from the early 1980s. Faintly discernible in the window on the right-hand side: “One Stop.” Thanks to Jan Taylor, Debra Dorst-Porada and the library for the find. I got a small scoop — a scooplet? — during a break in the Chino council meeting last week: a long-time councilman disclosed that he’s going to retire rather than seek re-election. That, plus a Valley Vignette, makes up Sunday’s column. I attended my first Chino council meeting in seven months and caught up. Development issues seem likely to dominate 2018 as they did in 2017. Also, a councilman is in hot water. 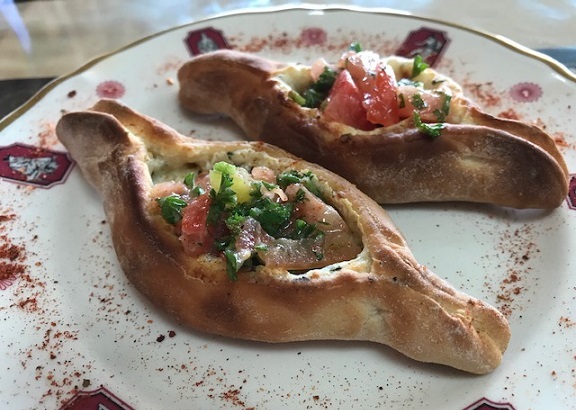 Join me for Friday’s column, won’t you? Usually I attend only one Montclair City Council meeting per year, but here I’ve gone to two in a row. At the first one, some council members reversed their decision on a 30 percent raise to return to the original proposal of 55 percent. Monday night they made it official — with two dissenters. I report out from the entertaining meeting in Wednesday’s column. Greetings, aesthetes! (It sounds better than “nerds,” doesn’t it?) 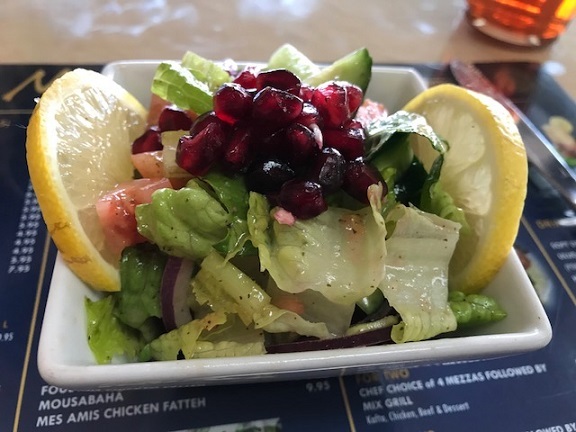 Welcome to this blog’s first Reading Log of 2018. 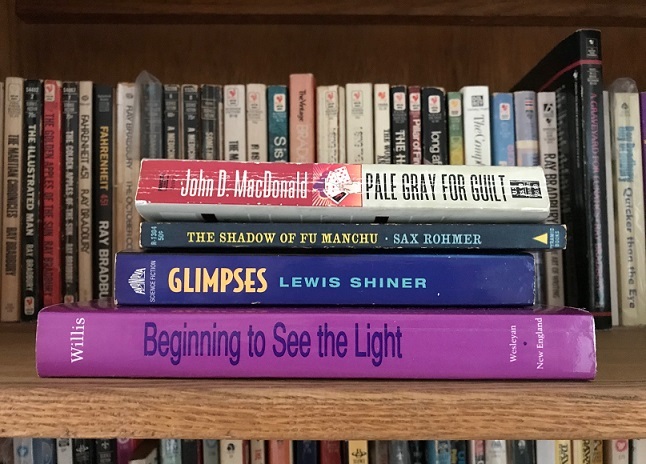 I started the year off with a quartet of books I’d been planning but failing to read for a few years, all with a kind of shadowy, half-seen tint to the titles. Like life, but unlike old movies, it was not a black and white month. First up was my first Travis McGee mystery since 2014. Sheesh, I liked the idea of reading at least one per year, but the seroes got away from me. But here was Book 9 (of 21) waiting for me. McGee calls himself a salvage expert: He goes after things of value that are considered irretrievable, and claims half if successful. Then he returns to his boat-bum lifestyle in Florida, taking his retirement in installments, as he puts it, until the next case comes along. “Pale Gray” involves real estate speculation and stock market scams, which get a bit complex. On the other hand, because the case concerns a dead friend, McGee is an avenging angel. He also suffers in various ways for his otherwise-envious lifestyle, making this entry more emotional and vulnerable than usual. First published in 1968, the attitudes in “Guilt” like the others can be a little dated. But MacDonald sure can write. In fact, there’s a fine maxim in it: “In any emotional conflict, the thing you find hardest to do is the thing you should do.” Chew on that. Next up was the 11th (of 14) books in the Fu Manchu series, which I’ve been reading intermittently since roughly the Civil War, or so it seems sometimes. This one was published in 1948, 35 years after the first (and 11 years before the last), and by this point Fu Manchu and his nemesis, Sir Denis Nayland Smith, are practically old friends. The plot involves a device under development that could disintegrate metal, which of course would include most weaponry, and thus is of great interest to America’s enemies. In attempting to foil the communists from seizing this mighty “transmuter,” the devil doctor is practically the savior of mankind. Oh, Fu, we hardly knew ye. “Glimpses,” from 1993, won the World Fantasy Award, but it’s basically “High Fidelity” with a dose of magic realism. A rock ‘n’ roll friend recommended this years ago, it was duly placed on my want list and, years later, a bookstore browse finally turned up a copy — autographed, no less. The late-30s protagonist of this novel set in the late ’80s tried to belatedly grow up while also engaging in wish fulfillment by hallucinating great lost albums by the Beach Boys, Doors and Hendrix into reality (or not). Recommended for music nerds — sorry, aesthetes. I’m one and I was enthralled. Lastly, “Beginning to See the Light,” from 1992, is a collection of ’66-’79 essays on rock music, current events, women’s rights and Jewishness by Ellen Willis, one of the first rock music critics. She went on to write on other topics, as can be seen above, and became newly appreciated when much of her work was reissued after her 2006 death. Some of these essays are dated, of course, but they reflect their times and offer a perspective on the ’60s, often from the vantage point of the ’70s, by someone who was there and lamented how others came to dismiss the era. Many of the essays are still relevant, sometimes depressingly so. (Peace in the Middle East, for one, seemed quite possible four decades ago.) Willis’ prose is dense but clearly reasoned and stated; she argues her positions well. Favorite essay title: “Abortion: Is a Woman a Person?,” wherein she tackles various anti-abortion arguments and (in my view) demolishes them. See above for her continuing relevance. The book left me wanting to read more by her. 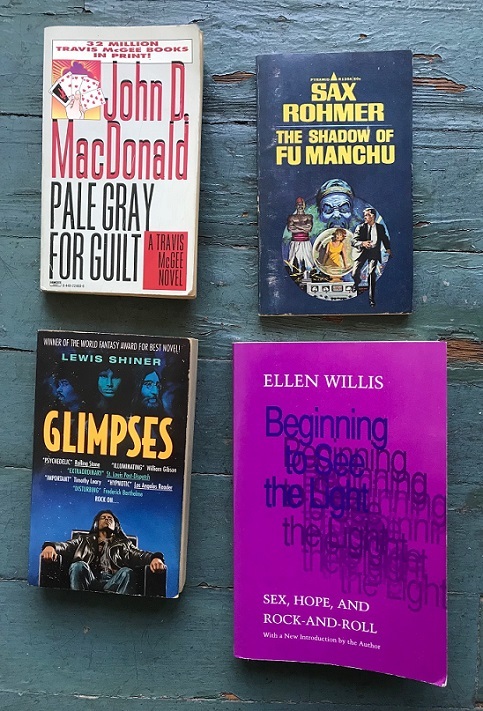 As for where these books came from, MacDonald was bought in 2011 at North Hollywood’s Iliad Books and Willis in 2013 from Glendale’s Brand Books (RIP). The other two were probably bought in the mid-2000s, prior to the blog, the Rohmer possibly from eBay and “Glimpses” from Glendale’s Book Fellows (also RIP). It was satisfying finally getting to these books. The good feeling should continue for a while, as February’s books are also going to be ones I’ve meant to read for quite some time (six years, in one case), and that theme may continue into mid-year, unless something comes up that needs to be read for work or I’m otherwise derailed. How is your new year starting, and what did you read in January? Post away. Next month: Hello, darkness, my old friend. 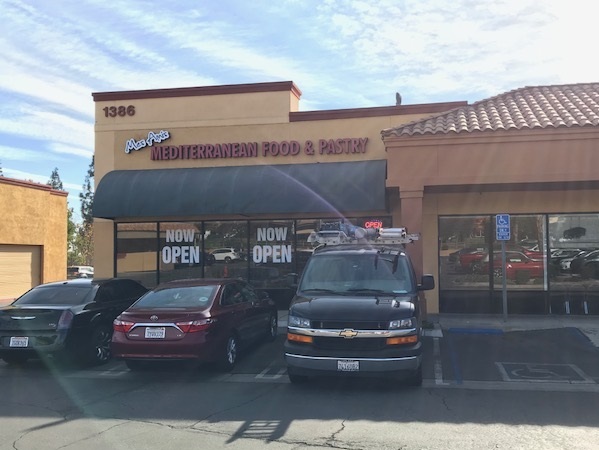 Sunday’s column begins with an update on Pomona’s Magic Door Books, which is still open even though the plan was to close at the end of 2017. Then I sock you with some Culture Corner items and more, ending with a Valley Vignette. I attended Wednesday night’s appearance at Scripps College by Krista Suh, the driving force behind the pussyhat movement. And beforehand I got to interview her for about 20 minutes. She’s the subject of my Friday column. 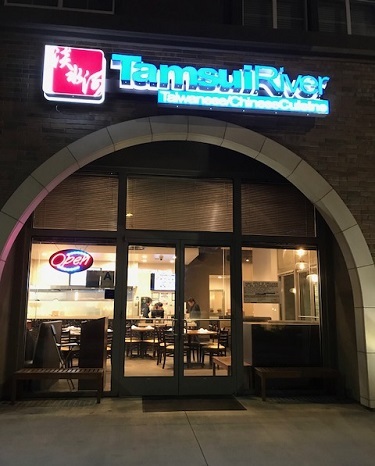 Tamsui River is on the old Person Ford site in La Verne, now apartments with some restaurants and retail facing Foothill Boulevard. 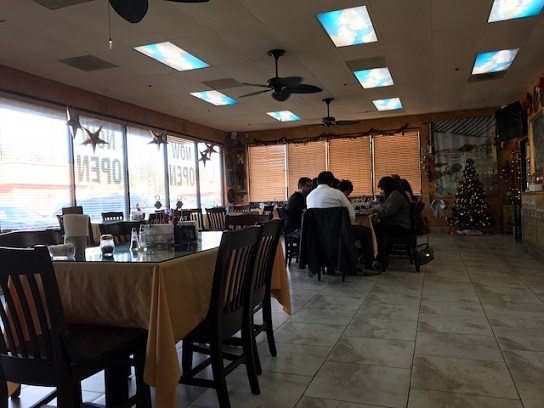 The restaurant has gotten high marks, but I hadn’t been there until just before Christmas, when a Chinese food-lovin’ friend was in town and I suggested we try it out. The L-shaped dining room is moderately sized, with an area separated by glass for a larger party. 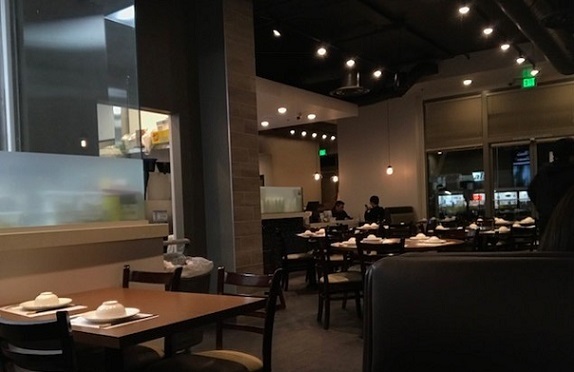 We were seated in a booth and examined the expansive menu of more than 100 items: soups, dumplings, noodles, seafood, etc. 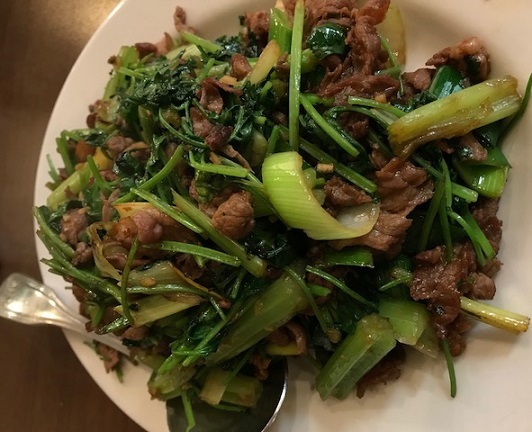 We got sauteed lamb with scallions ($14, above), smoked duck noodle ($11) and pork soup dumplings ($9). 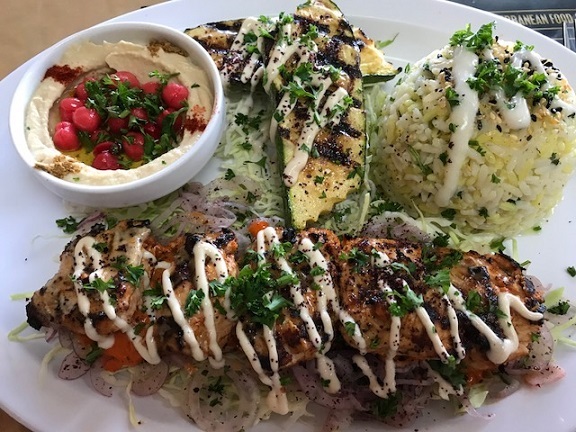 The lamb, similar to the cumin lamb that I’ve had elsewhere, was my favorite. 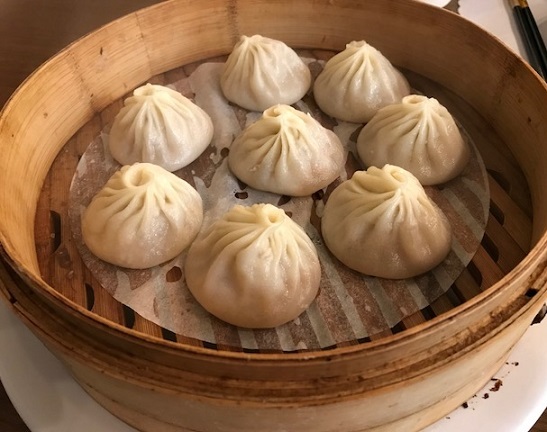 We liked the XLB dumplings (below), even if they wouldn’t make me forget Din Tai Fung’s. 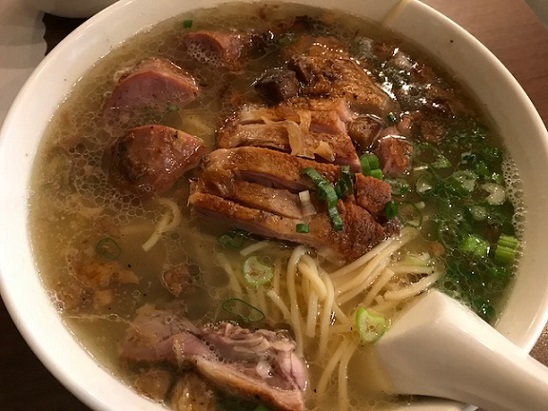 We were surprised that smoked duck noodle came as a soup (bottom), since it wasn’t listed under soups, but there was nothing wrong with it. Also, you know a Chinese restaurant is authentic when the menu isn’t online and they can’t be bothered to even have a Facebook page.